Get ready for a wonderful Easter Sunday at Brookdale Church! We’ll start the morning off with breakfast at 8:45, prepared and served by our own Men’s Ministry. 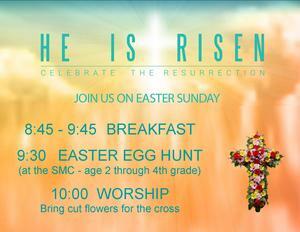 Young children (age 2 through grade 4) are invited to the SMC for an Easter egg hunt at 9:30. Finally, everyone will join together in celebrating the resurrection in worship at 10:00. If you are able, bring a couple of cut flowers for a special “flowering of the cross”.